is in no way affiliated with the companies who previously used this name prior to 2005 who sold M1 Carbines, other firearms, or anything else under this name. Please do not make inquiries of this company for items manufactured prior to their existence. Thank you. ATF yearly production records have provided the earliest information regarding the company operating under the Iver Johnson Arms name 2006 and later. From 2006-2009 they are shown as located at 190 Junction Rd in Hardwick, VT, manufacturing and/or exporting .22 caliber pistols. In the ATF 2010 report they had moved to Rockledge, FL, and were shown as an exporter of pistols only, with no firearms manufactured. They are absent from the 2011 report, indicating nothing manufactured or exported. Squires Bingham International was incorporated in Vermont May 19, 1987. Their address in Island Pond, VT, was at some later point changed to 190 Junction Rd. 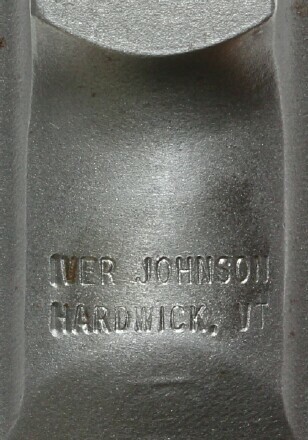 in Hardwick, VT. Essex Arms Manufacturing was incorporated in Vermont on September 20, 1988. Initially they shared the same address as Squires Bingham International in Island Pond, VT. The president and secretary of both companies was Neal Kirschner and Donna Kirschner. Essex Arms manufactured 1911 pistol frames and parts. An historical examination of the Essex Arms website located the following: "In Nov. 1999 Essex Arms moved into our new facility in the rolling hills of Hardwick VT. Along with the new building we purchased all new CNC's and new fixtures. This alone allowed us to expand our product line and more important increase the quality of the product. That is why we are giving our products a life time warranty. ... Essex Arms is owned by Americans and our slides and frames are made right here in the USA." Since October 2010 the Essex Arms website no longer offered 1911 products, stating: " We are currently in the process of changing our machine plant location. We will be out of production until at least mid year 2011. Please check back to the website at that time for questions, orders, and availability. Thank you." The website continues with ... "There are complete slides and frames available for order right now at the Iver Johnson website. Each slide and frame comes finished and complete with all parts. Please go to the below link for pics and prices: http://www.iverjohnsonarms.com. Our new PO box is 561294 in Rockledge, FL 32956." Squires Bingham International had been incorporated in Florida April 11, 1973. Corporate records available online since 1995 have identified Neal Kirschner as their president with several address changes over the years. In 2002 their address was changed to 1840 Baldwin St., #10, in Rockledge, FL 32955. In 2012 their address was changed to 259 Gus Hipp Blvd, Rockledge, FL 32955. Iver Johnson Arms Inc. was incorporated in Florida on April 17, 2003 with their address being 1840 Baldwin St., #10, in Rockledge, FL 32955. Their president, vice-president, secretary, and treasurer were Neal Kirschner. In February 2012 their address was changed to 259 Gus Hipp Blvd, Rockledge, FL 32955. Several 1911 model handguns in several different calibers manufactured under contract to Iver Johnson Arms by Shooters Arms Manufacturing in the Philippines. U.S. manufactured frames onto which have been assembled an upper manufactured by FN in Belgium for the Baby Browning model pistol in .25 ACP. A derringer and M1 Carbine are depicted at the bottom of their current home page, under the caption "Derringer and M1 Carbine not available for order as of yet". Yearly ATF reports of firearms manufacture for the companies affiliated with Kirschner have shown no evidence of the companies having manufactured any rifles (carbines included). he challenge for any private company wishing to manufacture M1 Carbines, or any other firearm, is being able to turn a profit that makes the investment worthwhile. Over the years more than a few people and companies have gotten into the business only to find out afterwards that overhead costs exceeded expectations, and/or the market demand has not been strong, often due to the number of surplus U.S. M1 Carbines available at various times. The above said, receivers and a few carbines with the name of Iver Johnson Warwick, VT. have been observed. It appears the company took the initial steps to begin manufacturing carbines but halted operations before any were completed. The receivers intended for use with these carbines have been sold and resold, a few owners have assembled these receivers into .30 caliber M1 Carbines using commercially available new and used parts. Some have been sold as used guns. been inspected by a competent gunsmith who should be asked to check to make sure the receiver was hardened properly. Serial numbers seen so far have ranged from J900038 to J900127 (single J prefix, not the previously used JJ prefix).